Attention EVERYONE! !Weclome to the Dool House benefiting Camp TLC..
Don’t Miss this ONE NIGHT ONLY fundrasing Spectacular! Join us for a never seen before production including unexpected creative performances by the A.F. 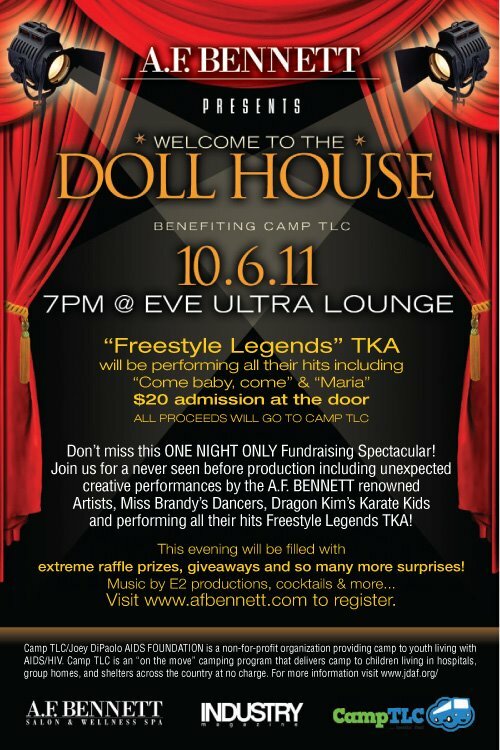 BENNETT renowned Artists, Miss Brandy’s Dancers, Dragon Kim’s Kartae Kids and performaing all their hits FreeStyle legends TKA! This evening will be filled with exterme raffle prizes, giveaways and so many more suprises! Tomorrow night at EVE we are hosting AF Bennetts fundraiser! All proceeds will go to CAMP TLC. Its for a great cause, and all ages are welcome. Please come and support the cause! TKA will performing and there will be tons of other acts!! Doors open at 7pm, $20 donation. Staten Island Top Comedian Birthday Party at Cirque Du Eve March 31st New York Top Comedian – I am doing it again tonight!